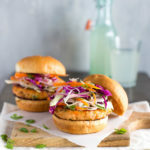 Unlike last week’s Vietnamese pork chops which were fairly authentic Vietnamese, these Thai salmon burgers are definitely not authentic Thai. But what these Thai salmon burgers lack in authenticity, they more than make up in taste. A liberal amount of sweet chili sauce not only let’s me say these salmon burgers are Thai-ish but it’s what gives the burgers so much flavor. Sweet chili sauce has sweetness, spice, and a little bit of heat all in one bottle and is one of my favorite cooking shortcuts. You get tons of flavor without a lot of effort – perfect for a weeknight meal. Don’t confuse sweet chili sauce with the chili sauce, sambal oelek. Sambal oelek is pretty much straight up chilis and can be very hot. Sweet chili sauce looks almost like a thin jelly and it usually comes in a bottle where as sambal oelek usually comes in a jar. I like to use King’s Hawaiian hamburger buns for this recipe because they are soft and fluffy which compliments the texture of the salmon burgers nicely. If you can’t find the King’s Hawaiian buns, a soft brioche bun would work too. Vietnamese banh mi sandwich. You can cut the cabbage yourself for the slaw but the pre-packaged shredded cabbage works great when you’re short on time (which is me almost every night). The slaw also adds a beautiful burst of pretty colors. And can’t we all use a little color to lift us from our winter doldrums? Cut the salmon into 1-inch chunks. Place the salmon pieces in the bowl of a food processor and pulse 5-8 times until the salmon is coarsely chopped but not pasty. Transfer the salmon to a bowl and add the sweet chili sauce, scallions, cilantro, panko bread crumbs, and salt. Stir to combine. Add the beaten egg and stir just until the egg is evenly mixed in. Place the bowl in the refrigerator to let mixture firm up before forming the salmon patties. While the salmon chills, make the slaw. In a large bowl, stir together the lime juice, rice vinegar, sugar, and salt until sugar is dissolved. Add the cabbage, carrots, red onion, cilantro, and mint. Toss slaw to combine. Set aside. Remove the salmon from the fridge. Divide the salmon mixture into six even mounds. With lightly greased hands, and working with one mound at a time, gently form the mixture into patties. Heat the oil in a large nonstick skillet over medium-high heat. Add the patties and cook about 4 minutes per side until salmon is cooked through. Place the bottoms of the buns on plates. Top with the salmon burgers, some of the slaw and the tops of the buns. Serve extra slaw on the side.